Arrow Fastener Company LLC is the leader in manual, electric and brad nail fastening tools for the professional building trades and do-it-yourself markets. Founded in New York City in 1929, Arrow quickly became synonymous with its heavy duty steel staple gun, the T50, and its full range of staples. 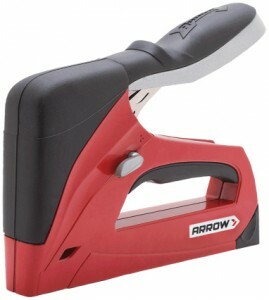 Time-tested for more than five decades, the Arrow T50 is the world's best-selling staple gun. With its headquarters and main manufacturing facility at Saddle Brook in New Jersey, USA, since 1962, the company now markets a full line of manual and electric staplers, electric brad nail guns, glue guns, hammer tackers, rivet tools and the fastening supplies. Many of them are specifically designed to make the job easier for pros and DIYers alike. With over 80 years of experience in innovative design and manufacturing of fastening tools for a wide variety of applications, Arrow Fastener has earned its reputation as a well-established and trusted supplier of durable, reliable and affordable fastening products. Following their traditions and goals for continuous improvement, Arrow Fastener is introducing its all new R.E.D line. The Arrow R.E.D™ Reliable.Ergonomic.Durable collection builds on their best-in-class features while adding style, enhanced functionality, durability and ergonomic comfort. Arrow Fastener is owned by MASCO Corporation, one of the world's leading manufacturers of home improvement and building products, as well as a leading provider of services that includes the installation of insulation and other building products. Master Distributors is the exclusive distributor of Arrow products in Australia and New Zealand, and have enjoyed building the brand in these markets for several years. Arrow products can be found at Bunnings, Blackwoods, Mitre 10, Stratco and other leading retailers.